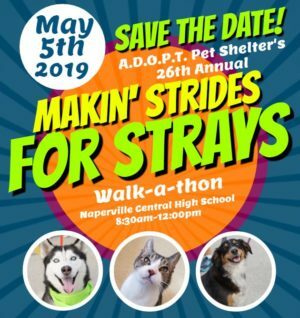 Mark your calendar for our 26th Annual Makin’ Strides for Strays Walk-a-thon! Come out on May 5th, 2019 to Naperville Central High School to join in a day of family fun that supports a great cause. The day consists of a 2.5 mile walk through downtown Naperville, music, vendors, food, face painting, and canine competitions. Furry family members are welcome! Registration for individual walkers and teams is now open! Check out our walk-a-thon page for more details.